PD Days are on Wednesdays at Forest City Middle School. There’s a shortened schedule, and students are let out at 2, which means from 2:15-4 is an all-staff meeting/professional development/teacher prep time. Today was my first experience with PD. The focus was on Standards-Based grading, which I know has gotten mixed reviews. In Standards-Based grading, students are given either a 4, 3, 2, or 1 in their assessments. A 4 is mastery, 3 proficiency (which is the goal), 2 is needs work, and 1 is in progress/developing. The problem with Standards-Based grading (SBG), to some parents, is that the category 4 is not clearly defined. Some argue that having a 4 defined makes students chase numbers rather than being creative. The other side argues that without a clear definition, how and why will students succeed or want to push for that 4? This chart shows words that teachers could use on their rubrics to describe the 4, 3, 2, or 1 categories without tying the requirements down to something too specific. After talking about this as a large-group, we broke into small groups and I helped my 6th and 8th grade co-teachers change their rubrics to reflect the mastery category. This was exciting for me, a chance to really get involved and understand the grading process! We also discussed what rubrics should look like, and that same teacher also presented us with a sheet of an example Mastery category. This sheet gave us ideas for forming our rubrics, and for someone still unfamiliar with SBG, this was really helpful! 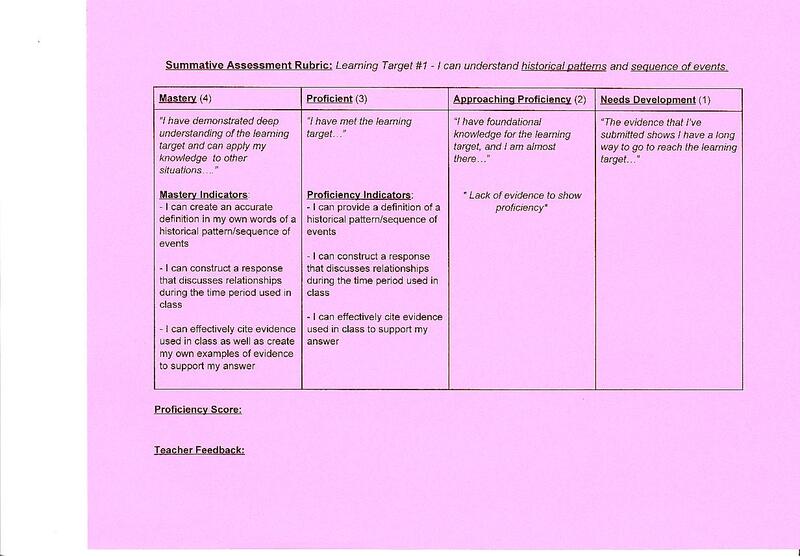 Here’s what the sample rubric looked like. It uses words such as ‘demonstrated deep understanding’ for mastery, rather than ‘demonstrated understanding’ which would be associated more with a Proficient or 3 category. As I reflect on my PD experience, I’m encouraged to see that I’m not the only one struggled with SBG. It seems to be a learning process for everyone, especially since this is a new grading system this year. I’m truly excited to learn more as we go! < Launching My Teachers Pay Teachers Site!